Kids love to play with their friends, and let's face it sometimes (OK most of the times!) they are messy. If after your kids’ playtime, your house looks like Hurricane Munchkin just hit, then our products are what you need. Hurricane Munchkin has the perfect storage bins, baskets, and boxes for your children. Our toy storage box is an ideal organizational tool that can be used for storing toys, books, games, art & craft supplies, linens, clothes, shoes, legos and just about any other thing around the kids' room. With sides reinforced by cardboard, our toy storage box is sturdy enough to hold heavier items making it more durable for your little ones wear and tear. It measures 13" x 13" x 13" so it can fit easily into most cube organizer shelves, including Ikea Kallax series. Hurricane Munchkin toy storage boxes are designed to make the work easier and fun for your children. Each one features a fun animal character that will make it interesting for your children as they tidy up their toys into the right bins. We guarantee that both you and your kids will love how fun and convenient cleaning up will be. 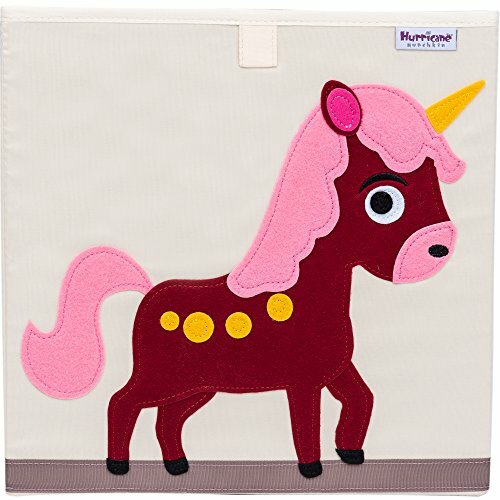 ✔ DESIGN SPECIFICATION: [13 inch x 13 inch x 13 inch] Hurricane Munchkin toy storage basket is constructed with high-quality 100% polyester and durable thick animal-themed felt applique. Our toy storage containers fit easily into most cube organizer shelves, such as Ikea Kallax series. ✔ ORGANIZATIONAL PURPOSES: Hurricane Munchkin toy storage bins are designed to simplify your child's playtime and your journey as parents. Our toy baskets are very versatile and multi-purpose. Mix and match cute animal designs for each compartment of your cube organizer to create a modern and functional playroom or a cozy reading nook for your children. They can store all your kid's essentials: toys, puzzles, books, games, arts & craft supplies, linens, laundry, clothes, shoes and legos. ✔ STURDY & STRONG, YET LIGHT WEIGHT: The sides and bottom of Hurricane Munchkin toy storage cube have been reinforced by cardboard inserts allowing it hold up against kids' regular wear and tear. The high quality felt material used for animal designs is thicker than other brands and is carefully embroidered on the cubes to prevent it from peeling off. Our toy storage box is large enough for bigger items yet durable, portable, and lightweight solution for toy storage needs. ✔ COLLAPSIBLE FOR EASY STORAGE: Hurricane Munchkin folding toy storage cubes are made with removable bottom insert that makes it easy to fold flat, saving on space when not in use. Therefore, they can be easily tucked away in closets or under beds. In addition, you can fold them up and use them on the go to store your kid's favorite toys for your car travels and road trips. Get rid of your regular cardboard boxes and enjoy a decorative and stylish storage basket instead! ✔ EDUCATIONAL AND FUN: We are parents too! and just like you we have been hit by Hurricane Munchkin regularly. Our toy storage boxes are designed with children in mind. The unisex gender neutral felt animal patterns are appealing for both boys and girls. Our playful toy bins will help you simplify the cleanup process without compromising style. They are also a thoughtful idea for a baby shower gift or use it as a baby shower gift basket and fill it with diapers, onesies, bibs, teethers etc. If you have any questions about this product by Hurricane Munchkin, contact us by completing and submitting the form below. If you are looking for a specif part number, please include it with your message.